When I lived in France I never had much luck growing sweetcorn, blaming the heavy clay soil for my lack of success. But the local markets would come up trumps with freshly picked sweetcorn. Our supermarket offerings won’t be so fresh but at this time of the year at least there are home-grown corn on the cob everywhere- keep an eye out and check the labels to verify the country of origin. 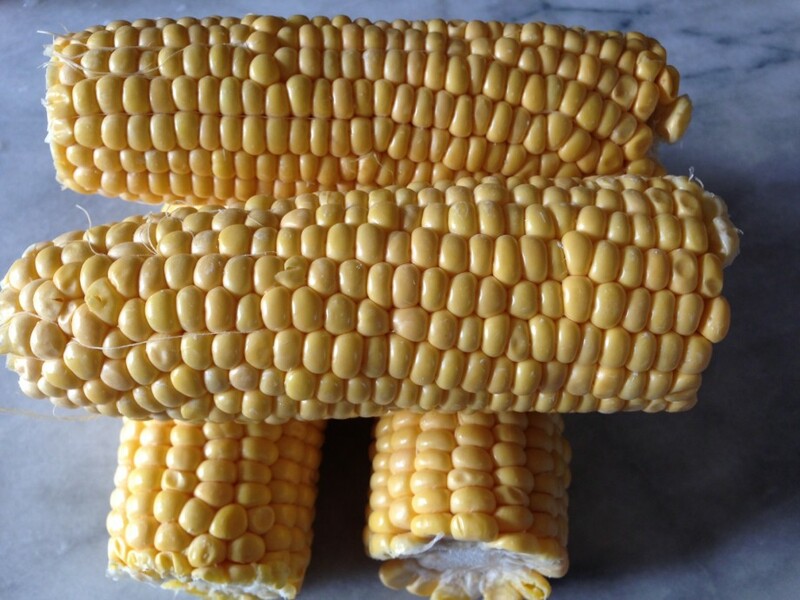 If corn isn’t fresh it can turn very starchy and lose its distinct sweetness. Canned or frozen is best during the winter months. We seemed to eat a lot more corn when I was a child-perhaps because children don’t mind getting messy, gnawing on the warm, buttery cobs. There are so many ways to enjoy sweetcorn; in soups and salads (see the latest recipes), grilled on the barbecue or griddle, in fritters or just au nature, smothered in a flavoured butter.